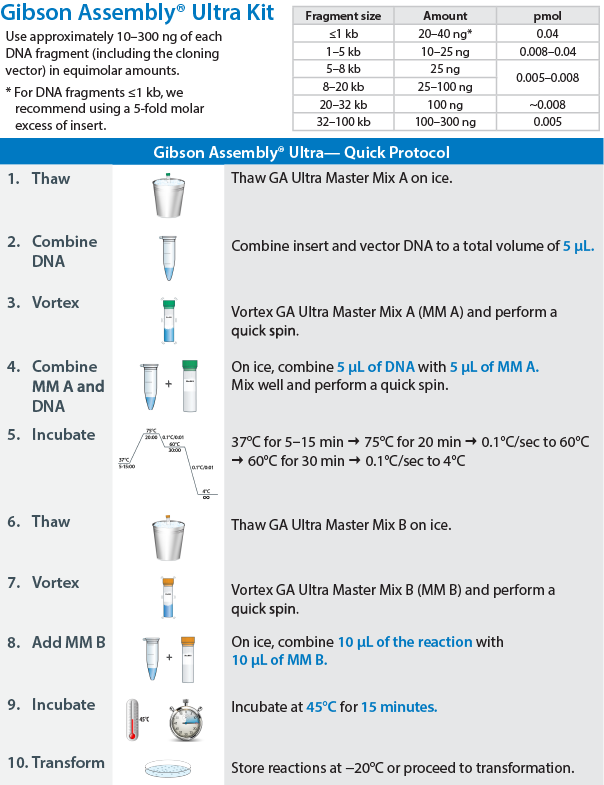 It may seem counterintuitive that a single kit would enable high-efficiency cloning of both very small (~100 bp) and large (100 kb) DNA fragments, but the SGI-DNA Gibson Assembly® Ultra kit accomplishes that and more. Engineered by Daniel Gibson and his team in their pursuit to synthesize a bacterial genome, the Ultra kit has roots in large-scale synthetic biology. What Daniel Gibson and other leading scientists have also discovered, is that the Ultra kit performs exceptionally well in enabling small-scale routine cloning applications quickly and efficiently as well. The Ultra kit mediates the seamless cloning of up to 15 DNA fragments in a two-step reaction in a single tube and can be used with any plasmid or BAC vector. The fragments for assembly can vary widely in size. Standard assembly of a 100 bp fragment with a pUC19 vector yields a circular construct less than 3 kb in size. On the other extreme, multi-stage assembly with the Ultra kit can be used to engineer large constructs 1,000,000 bp in length (1 Mbp). Completed in an 80-minute reaction with less than 6 minutes of hands-on time, constructs assembled with the Ultra kit are double-stranded, fully sealed, and can be used immediately in downstream molecular biology applications. To perform the Gibson Assembly® Ultra cloning method, prepare DNA fragments and your vector of choice with overlapping ends. Combine 10–300 ng (in equimolar amounts*) of each DNA fragment, the vector, and Ultra Master Mix A. After incubating the reaction components through a temperature cycle enabling chew back and annealing, add Ultra Master Mix B to the reaction. Following a 15-minute incubation at 45°C, the fully ligated constructs are ready to transform into competent cells. *We recommend a 5-fold molar excess of the insert for DNA fragments. Like the Gibson Assembly® HiFi 1-Step kit, the Ultra kit is available as a 5-reaction starter kit. Larger kit sizes, including bulk pricing, are also available. Whether you are planning a big or a small cloning project, our team of experts can help. Email us at info@sgidna.com for assistance.